Elizabethan Hats were an essential part of clothing for men in the 'Peacock Age' and played an important part in the fashion of the day. Hat brims were often turned up and fastened to the crown with a jewelled brooch or other ornament. Hat bands using scarves made of expensive fabric, such as silk, were often used as a form of decoration. 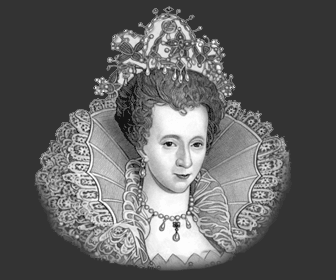 The Elizabethan fashion dictated that the head was adorned with a hat. The Upper Classes used a variety of materials in their hats but it is fascinating to note that in 1571 a law was passed which ordered everyone over the age of six to wear a woollen cap on Sundays and holidays in order to help England's wool trade. The Upper Classes were excused from obeying this law. Elizabethan Hats for Men - a comment dating back to 1583. During the Elizabethan era pamphlets were printed and distributed commenting on life in Elizabethan England. A writer of one such pamphlet was a well travelled Londoner called Philip Stubbes. "Some times they were them sharp on the crowne, pearking up like a sphere, or shafte of a steeple, standing a quarter of a yard above the crowne of their heades; some more, some less, as please the phantasies of their mindes. Othersome be flat and broad on the crowne, like the battlements of a house. Another sort have round crowns, sometimes with one kind of bande, sometime with an other; nowe blacke, nowe white, nowe russet, nowe red, nowe greene, now yellowe, now this, nowe that, never content with one colour or fashion two dayes to an ende. And as the fashions bee rare and straunge, so are the thinges wherof their Hattes be made, diverse also; for some are of silke, some of velvet, some of taffetie ,some of sarcenet, some of wool: and which is more curious, some of a certaine kind of fine haire, far fetched and deare bought, you may be sure; And so common a thinge it is, that everie Serving man, Countrey man, and other, even all in differently, do weare of these hattes . For he is of no account or estimation amongst men, if hee have not a velvet or a taffatie Hatte, and that muste be pincked and cunningly carved of the beste fashion; And good profitable Hattes bee they, for the longer you weare them the fewer holes they have. Besides this, of late there is a new fashion of wearing their Hattes sprung up amongst them, which they father upon the Frenchmen, namely to weare them without bandes;but how unseemlie (I will not say how Assy) a fashion that is, let the wife judge. Notwithstanding, howe ever it bee, if it please them, it shall not displease me. Another sort (as phantasticall as the rest) are content with no kind of Hatt without agreat bunche of feathers of diverse and sundrie colours, peaking on toppe of their heads, not unlyke (I dare not say) Cockscombes, but as sternes of pride andensigns of vanitie; and these fluttering sayles and fethered flags of defiance to vertue (for so they are) are so advaunced in England that every Childe hath them in his hat or cap: many get good living by dying and felling of them, and not a fewe proove themselves more than fooles in wearing of them." The prolific use of feathers to decorate the hat - even children had them in their hats.